Does your family go through times where they crave certain ethnic foods? Can’t get enough of them? That’s what we are currently experiencing. Our youngest is craving Asian food, which works well with a gluten free diet. 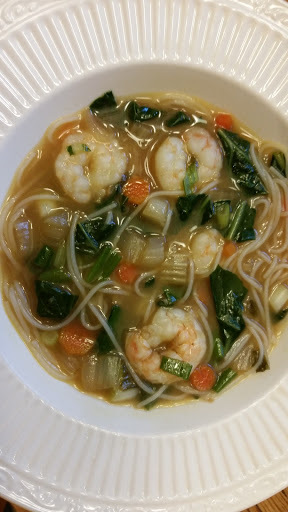 I found rice vermicelli at the international market, so her request was for an Asian soup. You probably noticed that the shrimp, green onions, and chicken broth boycotted the photo op. They did, however, make it into the party pot. Heat the sesame oil in a large stock pot over medium to medium-high heat. Add the white part of the bok choy along with the carrots and saute for 5-6 minutes. Add the garlic and ginger and cook for an additional minute. Add the broth, water, soy sauce and fish sauce. Bring to a boil. Remove from the heat and add the rice vinegar. You could use chicken, beef, or pork with this recipe. Just add your meat first because of the longer cooking time. The noodles would be added about 5 minutes before it is finished. This was a very good, light lunch. The youngest said it reminded her of homemade Ramen noodles, and what young person doesn’t love those!